I have been on the roll with testing various dinner rolls recipes to come up with a specific one, and ended up with some very tasty recipes. The one I will be posting today has been voted as the “favorite” by my granddaughter. Since I played with all of these recipes so much, I am not able to pinpoint the origin of this one, but it has been customized by me to my preference. 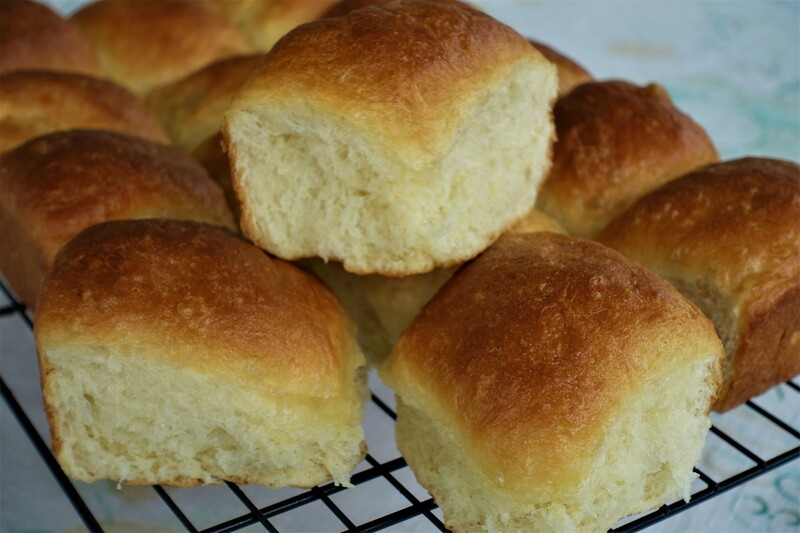 This recipe yields 12 dinner rolls. Pour 1/4 cup of warm water into a small bowl, dissolve 1 tsp. of sugar, sprinkle yeast over it and mix to blend. Let it proof itself for 10-15 minutes in a warm place. In a medium bowl mix the warm milk with remaining sugar, until the sugar dissolves. Mix in the beaten egg, salt, vanilla extract, and melted butter. Add proofed yeast to the milk mixture. In a large bowl combine the flour with the wet ingredients until soft dough forms. Knead the dough for 10 minutes. Place it in a greased bowl, turn the dough once to oil both sides. Cover with tea towel and let it rise in a warm place until double in bulk, about 2 hours. Punch it down, and knead again for 5 minutes, on a lightly floured work area. Form a rectangle from the dough, and cut it with a sharp knife into 3 section lengthwise, then into 4 sections width-wise, to form 12 rolls. Prepare a 13 x 9 baking sheet by lining the bottom with parchment paper, grease the bottom and sides of the pan. 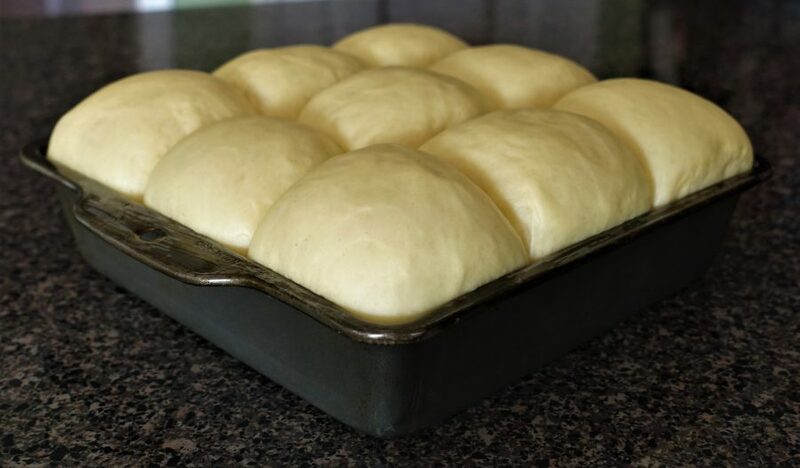 Form smooth rolls from each piece of dough, by folding the sides under, leaving a nicely smooth tops. Place 4 rows of 3 rolls each in the pan. Cover with a tea towel, and let them rise in a warm place until they extend above the rim of the baking pan (see the picture in the post). Brush the tops of the buns with room temperature milk, for lighter color crust, or with an egg wash for a darker color. As soon as the buns are removed from the oven, brush the tops with melted butter. Let them cool in the pan for 10 minutes, then remove onto a cooling rack, to cool completely.